If I told you how many times I had to make this recipe so that it would turn out OK, you would make fun of me and would ask why I tried to make it so many times. There were many attemps and almost all had horrible results since the starch content that sweet corn has in Colombia is way higher than the one you find in other countries. The same goes for potatoes and that’s why soups don’t thicken as well as the ones you make in Colombia. So, if you’re frustrated becasue the ajiaco you make at home does not thicken well enough, it’s not because you’re a bad cook, it’s because the potatoes don’t have enough starch. 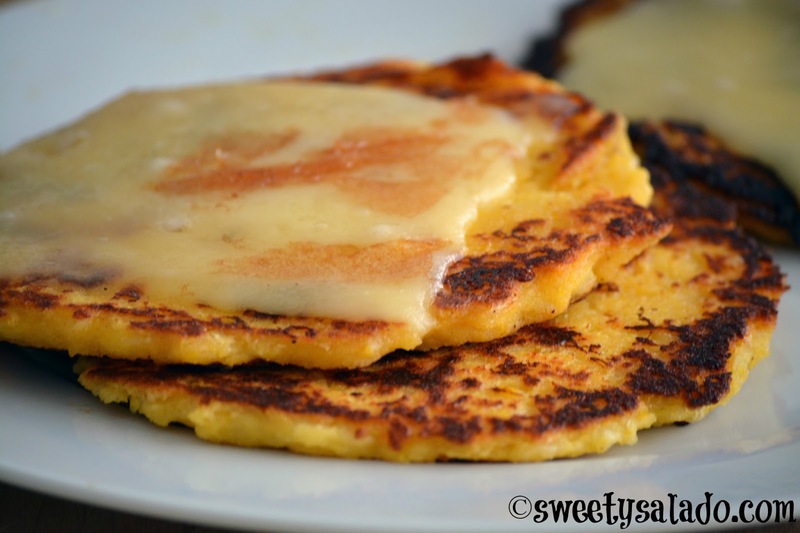 The first few times I made these arepas I followed several Colombian recipes that I found on the Internet, but I only ended up with a horrible, thick batter in the pan because they never bound, meaning, they never thickened up. The same thing happened with the recipes I found in two Colombian cookbooks and with the ones I found on YouTube. I remember well that my mom suggested I add pre-cooked cornmeal, but I didn’t want to do it because that’s not how you make them in Colombia. I wish I had listened to her because I would have saved myself a whole lot of headaches. When I finally decided to follow her advice, the question now was, how much cornmeal to use? Because we don’t want them to have the same flavor as the regular corn arepas, but at the same time, we want them to be firm and not lose their shape while cooking. After I tried many times, I finally got the gist of it and the result is the recipe I am sharing with you today. The texture is very similar to the arepas that people make in Colombia and the flavor is identical. 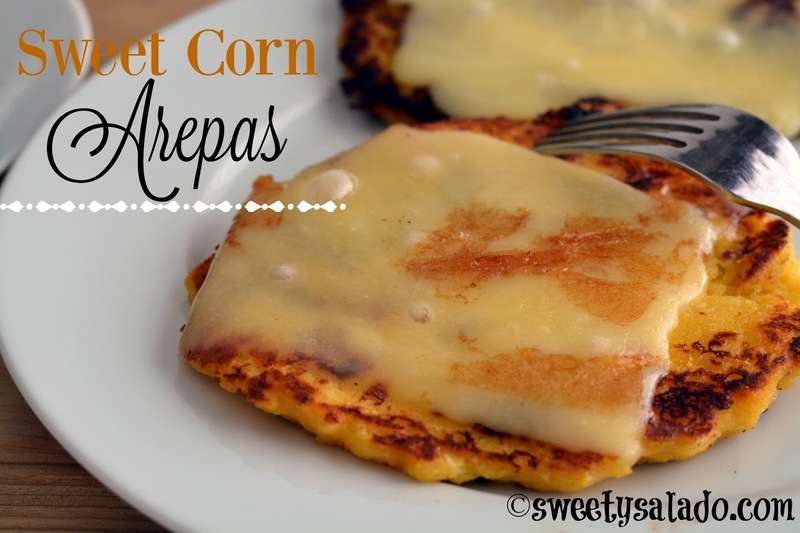 I would’ve loved to be able to make them with just the sweet corn and without having to add the pre-cooked cornmeal, but what can you do? Outside of Colombia is practically impossible. Blend the corn in a blender or food processor until you get a puree. Set aside. In a large bowl, mix the pre-cooked cornmeal, sugar, salt, mozzarella cheese, milk and meldted butter. Start with 1½ cup of milk and then add more if you see that the batter is too thick. 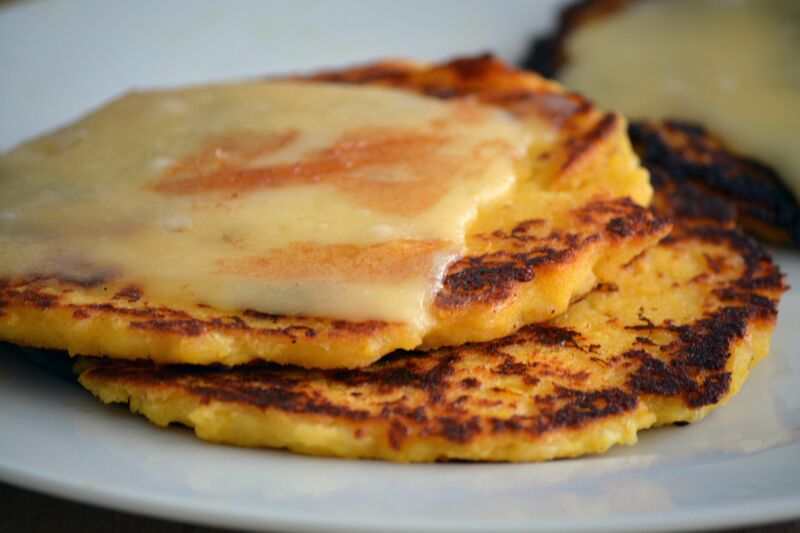 Melt 1-2 tsp of butter in a large pan on medium heat and then pour about ¼-½ cup of the corn batter, depending on how big you want the arepas. Flatten them on top and then shape them into a circle with the help of a spatula. Grill them for 5-7 minutes per side or until they're golden brown. During the last 2 minutes of cooking, you can place 1-2 slices of mozzarella cheese on top so that it has time to melt. Serve immediately. I'm waiting for this yep!!!! I've always loved Arepas de Chocolo and look forward to eating them at festivals. Now, thanks to you, I can make them at home. Today was my first time making them from your recipe and they are delish. My son also ate a whole Arepa 🙂 Thank you, Diana. I used Trader Joe's frozen sweet corn and that corn was wonderfully sweeeeet!